Healthy Kidneys clean your blood make hormones to keep your bones strong and your blood healthy. When kidneys fail, you need treatment to replace the work of kidneys used to do. Unless you have a kidney transplant, you will need a treatment called dialysis. Uses the lining of your abdomen, called the peritoneal membrane, to filter your blood.During the treatment, your abdominal area (called the peritoneal cavity) is slowly filled with dialysate through the catheter. The blood stays in the arteries and veins that line your peritoneal cavity. Extra fluid and waste products are drawn out of your blood and into the dialysate. There are two major kinds of peritoneal dialysis. 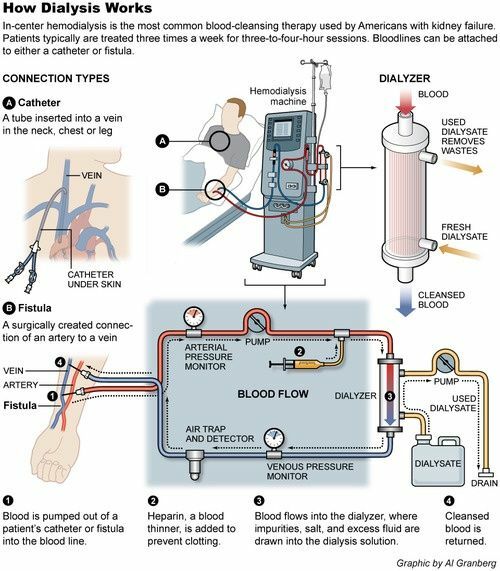 Continuous cycler peritoneal dialysis (CCPD): This uses a machine to do your exchanges. Continuous ambulatory peritoneal dialysis (CAPD): You’ll do your exchanges by hand. You’ll likely do four to six exchanges each day. Your doctor can help you decide which type fits your lifestyle. Some people do both. What Is the Long-Term Outlook for Someone Who Needs Dialysis?